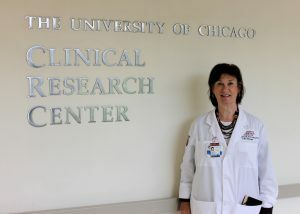 The University of Chicago Institute for Translational Medicine (ITM) recently welcomed Kathleen Mansell as the new manager of its Clinical Research Center (CRC). Mansell, previously a clinical research coordinator at Adventist Medical Center hospitals, now manages the CRC, an ITM unit that gives investigators space, specialized research services and other resources for patient-centered clinical and translational research. Her role in the CRC’s evolution will draw more researchers and patients to the center. The CRC was founded in 1961 after receiving funding from the NIH. Since then, the center has received millions in additional funding, and it is now one of less than 60 facilities in the country specifically designed to provide a one-stop shop for investigators to conduct human subject research. Without these designated centers, investigators are left to find spaces, resources, services and subjects from any number of sources, an often confusing and disorganized way to get a research project off the ground. Directed by Arlene Chapman, MD, UChicago’s CRC now services about 100 investigators with more than 20 specialized research services, laboratory facilities and data collection capabilities, facilitating research that might otherwise be impossible to do. Mansell, who also has a Master of Science in Nursing and certification in Clinical Research, will continue to grow the center and build upon internal policies and procedures to ensure continued safe, efficient and patient-centered research. Mansell, drawing on her over 10 years’ experience as a clinical research coordinator, said she is working on getting the ITM CRC name out there to attract more UChicago investigators and, as a result, more patient volunteers for their research. She said there are many benefits of conducting research at the CRC. For instance, researchers can access 23 services available exclusively at the CRC, including the metabolic kitchen, salivary cortisol testing that checks for certain hormonal conditions, and more. Study participants benefit as well. As a byproduct of the health screening necessary to participate in clinical trials, Mansell said that patients can receive diagnostic tests and other benefits, in addition to any compensation for contributing to the study. “We’re putting standards in place so we can be sure the patient is receiving the best possible care while participating in clinical trials,” Mansell said. And the benefits of CRC-based studies move far beyond the center itself. Past CRC-supported research has gone on to impact human health around the world. For example, Eve Van Cauter’s, PhD, research helped identify sleep deprivation as a cause of diabetes in Japanese populations, and her sleep study research with Esra Tasali, MD, is pinpointing and working to remedy health risks associated with sleep deprivation. Mansell said she looks forward to adding to the list of breakthrough research projects done at the ITM’s CRC and seeing the ways those findings are applied to help people around the world. Having previously worked as a nurse and at hospitals where research was not a central focus, Mansell said she is thrilled to be in an environment where research – and its impact on human health – is a priority. If you’re an investigator who would like to learn more about conducting research at the CRC or an individual who would like to participate in a CRC study, visit the ITM website to learn more. To learn more about the CRC or connect with Mansell, contact her at kmansell1@bsd.uchicago.edu.